It's very hard to not talk about what event will take place on August 26, 2017 at T-Mobile Arena in Las Vegas, NV. Would I dare to call the Conor McGregor vs Floyd Mayweather The Fight Of The Century? But I will say this, it will be a huge payday for those involved. There is no doubt that McGregor and Mayweather will earn hefty paydays for the bout. The asking price for the right to be the title sponsor for the upcoming Mega Main Event between Mayweather and McGregor has been set at $10 Million. That eight-figure sum nets the sponsor a logo in the middle of the ring, as well as branding the ring girls, two of the ropes, and the two non-fighter corners of the rings. The sponsor will also be featured in the first minute of every round. WWE-IMG is also offering $5 Million each for the fighter corners, which entails signage and a presence on the broadcast corner camera. In total, the $20 Million would be the largest ever for a fight, according to ESPN's Darren Rovell. None of these numbers even include what this fight will cost on pay-per view. I know I won't pay this astronomical fee because I'll be going on My Honeymoon to Hawaii, and also attending My Niece Brooke's Wedding. So there is a good chance many of us will watch this together somewhere in paradise. The last time I bought a fight was on June 28, 1997 when Mike Tyson bit off part of Evander Holyfield's Ear and was disqualified from the match and lost his boxing license. I paid $50 to watch a bizarre piece of history for all the wrong reasons. But when you look at this fight as a whole, I'm glad that this is taking place. First of all, all you'll have going on in late August is the MLB Regular Season and the NFL Pre-Season. The promoters were smart by not setting the contest during the pennant chase for MLB in September. The timing will liven up the summer just before Labor Day. Plus, the NFL Regular Season will be underway. I can only imagine what the ticket prices will be for this match. Fans better have deep pockets to attend this fight. UFC President Dana White was smart when he didn't stand in the way and worked with McGregor to get his most valuable fighter a chance to get the biggest payday of his life. 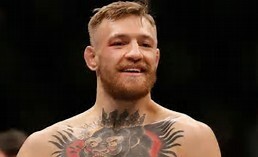 Forget the fact that Mayweather is 49-0 and looking to improve to 50-0 with a win and McGregor would love nothing better to give him his first loss. Over the next several weeks there will be more opinions about why this fight should or shouldn't have taken place. There will be so many predictions about who will win this fight. However, I'm going to take a philosophical approach about what to expect in this crossover bout between MMA and Boxing. McGregor has everything to gain and nothing to lose. Many experts don't feel he belongs in the same ring with Mayweather, therefore in the eyes of many, nobody expects him to win. But I believe that anything can happen when two fighters are in the ring. There have been no shortage of upsets in boxing through the years. Two that standout include Muhammad Ali defeating George Foreman and Buster Douglas defeating Tyson. What I'm saying is if McGregor lands one devastating punch that hits Mayweather in the wrong place, Mayweather will drop to 49-1. I do believe that defensive style and experience of Mayweather will be more than enough to defeat McGregor and he'll be 50-0. But what if McGregor wins? Will this open up the floodgates for more of these crossover matches to take place? I would definitely say yes, and these promoters will work with White to create more bouts. Where there is cash, there is opportunity and there will be no shortage of sponsors and television opportunities. After all, it's all about Entertainment! Will McGregor take the Rocky Underdog approach and feel that he was competitive by going the distance with Mayweather, thus earning him a moral victory? So for all of those critics that are opposed to this fight, my advice to them is ride a mule in the Kentucky Derby because they're a bunch of clowns. Mayweather has been a great champion in Boxing because he doesn't dodge opponents and will fight anyone. All the money he's made is well deserved and he's an outstanding business man! He's a future Hall of Fame Inductee. When I was growing up, there were boxing matches all the time in all divisions. Nowadays, fans can't identify Boxers anymore. 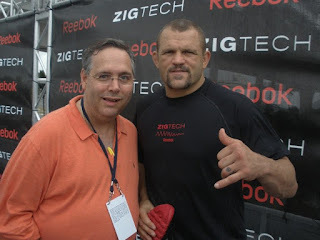 Chuck Liddell, who I'm with in the photo put MMA on the map, and now the sport is thriving thanks to the work of Dana White and it's gaining more and more respect by the minute. It's definitely going to be one Huge Mega Event that is worth watching and talking about for years to come. Entertainment is what this is all about! This fight came together because the public wanted it and everybody worked together to make it happen. So Let's Enjoy The Mega Event Of The Summer. If by chance Mayweather were to lose this fight, can you imagine what a rematch would be worth? So we'll just let our imaginations run wild about what the sequel would be like as many folks in the Boxing Industry experienced during the sport's heyday for many years. We all waiting for the Mega fight between McGregor vs Mayweather, this boxing fight going to get the most PPV sells ever, What a match ! !